Contact persons: Professor Gunnar Lidén, phone: +46 (0)46 222 0862. The department has established research collaboration on Biomass pre-treatment, Enzymatic Hydrolysis, and Biomass Manufacturing and Process Development with the state-owned Indian Oil Corporation. The collaboration is based on an agreement that was formalized by an MoU in October 2013, obtained through help from Invest In Skåne and Business Sweden and with financial support from the Swedish Energy Agency. Professor Gunnar Lidén is leading the collaboration on behalf of the Chemical Engineering department, but Associate Professor Mats Galbe is also involved in the project on the Swedish side. Read an article entitled ”Forskare samarbetar med Indien” by journalist Kajsa-Stina Kalin in the Swedish daily Sydsvenskan from 1 November 2013. 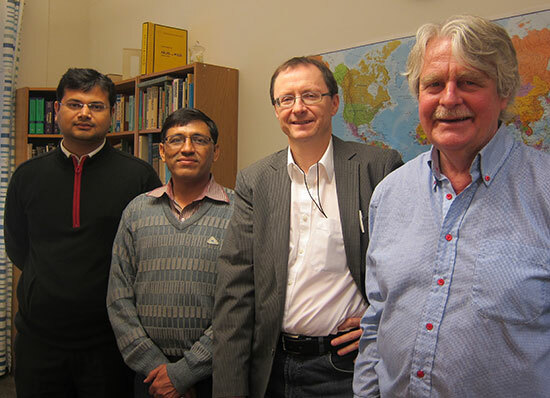 Indian Oil researchers Alok Satlewal and Ravindra Kumar along with Prof. Gunnar Lidén and Lars Eklund from SASNET. In February 2014, two senior scientists from Indian Oil’s Bio Energy Research Center in Faridabad spend two weeks at Lund University with the ambition to explore the ongoing biofuel energy research at Lund University within LU Biofuels, and exchange expertise. They were Dr. Ravindra Kumar, Senior Research Officer working in Organic Chemistry; and Dr. Alok Satlewal, Research Officer and a microbiologist. Their visit marked the beginning of the new research collaboration. Indian Oil, with its headquarters in Mumbai, is India’s largest refiner and fuel retailer with a state of the art Research and Development Center manned by over 400 scientists across the country. The main location is the Bio Energy Research Center in Faridabad outside Delhi, where focus lies primarily on bio-fuel research. More information about the research centre. The collaboration agreement on short term exchanges of researchers between Lund university and the Indian Bioenergy Center in Faridabad was extended with two years starting June 1, 2015. The Bioenergy center is located at the central research site of Indian Oil corporation in Faridabad, but is jointly financed by Department of Biotechnology, Ministry of Science and Technology, and Indian Oil corporation. Both parties were highly positive to a continuation, and the extension agreement was signed by the Vice Chancellor at Lund university in the end of May. On 11 February 2014, Lars Eklund and Hawwa Lubna from SASNET made a networking visit to the Dept. of Chemical Engineering in order to meet with Prof. Lidén and the two visiting Indian Oil researchers. Professor Lidén then informed that this is the first time his department has established a research collaboration with a huge corporation in India. The aim is to form a viable and crucial partnership for expanding biotechnology and renewable energy research in South Asia. Outside the DBT-IOCL Bioenergy Centre in Faridabad. Mats Galbe in the front, Gunnar Lidén to the left. 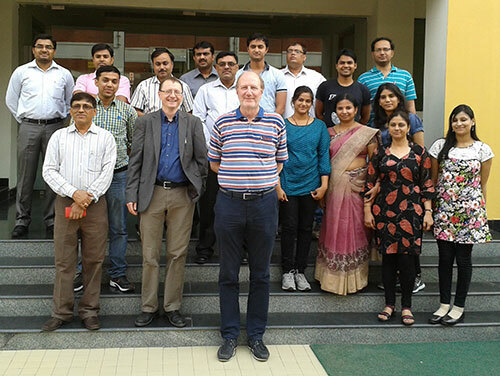 Mats Galbe and Gunnar Lidén visited the DBT-IOC Advanced Bioenergy Research Centre in Faridabad, India, in April 2014 to discuss the on-going collaboration between Lund University Biofuels researchers and the Bioenergy Centre. The Bioenergy Centre is in a rapid state of development, and the research discussions were both intensive and fruitful. 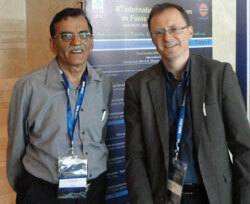 The guests from Lund also participated in the 9th International Symposium on Fuels and Lubricants (ISFL), held in Faridabad 15-17 April (more information). Gunnar Lidén was here invited to hold a keynote lecture on development of lignocellulosic ethanol. On photo above, Dr Tuli, Executive director of DBT-IOC Advanced Bioenergy Centre, and Professor Lidén, at the 9th ISFL meeting. 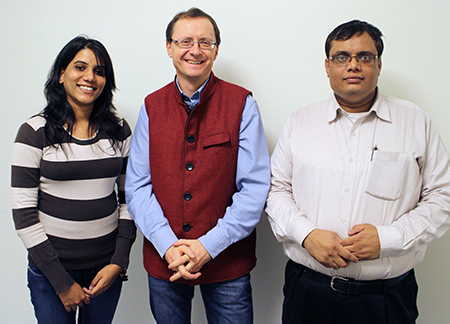 In November 2014, another two Indian Oil researchers came to Lund University as part of the collaboration. Dr Ajay Kumar Sharma from DBT-IOC Bioenergy Research Centre, working on fermentation technology, has a temporary office is at the department, whereas a colleague of Dr Sharma, PhD candidate Shveta Soam – working with Life cycle assessment of biofuels – visited the neighbouring Division of Environmental and Energy Systems Studies (IMES), part of Lund University’s Department of Technology and Society, where she is hosted by Prof. Pål Börjesson. See photo of Gunnar Lidén surrounded by Shveta Soam and Ajay Kumar Sharma. Shveta Soam is basically a botanist and environmentalist, with two masters degrees. Her PhD work focuses exclusively on Life Cycle Assessment of biofuels. LCA is a technique to assess the environmental aspects and potential impacts associated with a product, process, or service, by: Compiling an inventory of relevant energy and material inputs and environmental releases. Evaluating the potential environmental impacts associated with identified inputs and releases. While being at Lund University, she works on the Life Cycle Assessment of fuel ethanol from rice straw in India. This is a great learning experience since in India there are no commercial pilot plants for ethanol production. In August 2015, a new Indian PhD candidate joined the department. Krithika Ravi has a M.Sc in Pulp and Paper Technology from Indian Institute of Technology (IIT) Roorkee, and a B.Sc in Biotechnology from Anna University, Chennai, India. She will work in the new SSF project on Lignin. After attending the SASNET Media Workshop 7–9 December 2015, SASNET deputy director Lars Eklund also made a visit to the Indian Oil Corporation’s Research & Development Centre at Faridabad, outside Delhi. He was invited by researchers at the Centre for Advanced Bioenergy Research, involved in a frutiful research collaboration with the Faculty of Engineering at Lund University. The collaboration with Lund focuses on Biomass pre-treatment. During his visit to the Faridabad R&D Centre, Lars met Dr. D.K. Tuli, Executive Director and Coordinator for the Centre for Advanced Bioenergy Research, in charge of the Swedish collaboration, and the entire staff (photo). It should be noted that the Dept. of Chemical Engineering is also the home department of two important academic personalities at Lund University, with whom SASNET has had much interaction over the years, namely Professor Anders Axelsson, till 2014 Dean/Rektor of the Faculty of Engineering (LTH); and Professor Per Warfvinge, Assistant Dean for Education and International Relations, Faculty of Engineering (LTH). Per Warfvinge was an active member of SASNET’s Reference group in 2010-2011, preparing a proposal regarding Lund University’s South Asia Strategy for the period 2012 – 2017. The final report, compiled by SASNET Director Anna Lindberg, was handed over to the Vice Chancellor Per Eriksson on 20 June 2011. Read the full report.